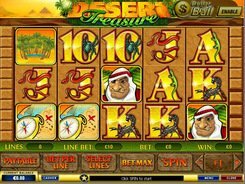 The five-reel Desert Treasures video slot released by Playtech is dedicated to adventures and treasure hunting. The set of symbols includes a cobra, a camel, a map and other themed icons. The coin values fall within the limit of $0.01–$1, with the top bet reaching 200 coins. 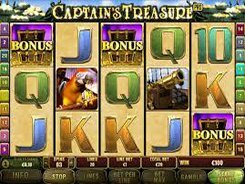 The slot has a jackpot of 10,000 coins. The gamer may try to take advantage of betting on any of the 20 paylines. Golden Cobra is the wild symbol. 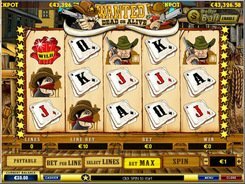 When five cobras roll out on any payline, you get an immense jackpot equaling x10,000 your bet. Two, three or four golden snakes will make you richer by 10, 200 or 2000 coins, correspondingly. The Princess symbol acts as the scatter. 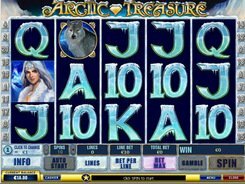 When at least three of them hit the reels in any position, you receive ten free spins with your winnings twice as much of your total bet. There is a separate bonus round triggered by three Compass symbols appeared on reels 1, 2 and 3. In the “pick’em up” bonus game you will unveil mysteries of the hidden treasures and get a big cash prize. 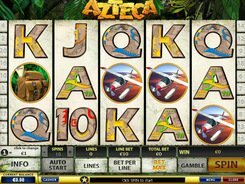 The Autoplay feature is not available in the slot machine. PLAY FOR REAL MONEY!